Give the gift of a magical do-nothing day! This picture book with startlingly beautiful words and pictures will spur imagination and a break from boredom or screen time. Now a New York Times Best Illustrated Book of the Year and Bank Street College of Education Best Children's Book of the Year! 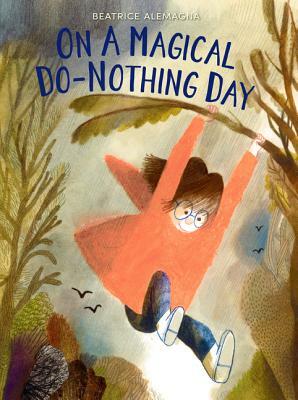 While reading On a Magical Do-Nothing Day, one gets the sense that the illustrator became lost in her drawings, and as a reader, you'll want to do the same. Perfect for fans of picture books by Julie Morstad, Carson Ellis, Jon Klassen, and Tomi Ungerer. “Hands down, Beatrice Alemagna is my favorite contemporary illustrator," said the Caldecott Honor-winning illustrator of Last Stop on Market Street, Christian Robinson. On a Magical Do-Nothing Day has been recognized with a Gold Medal from the Society of Illustrators. Don't miss this picture book that beautifully encourages unplugged exploration. Beatrice Alemagna was born in Bologna, Italy, in 1973. At eight years old she knew she would become a painter and a writer. Since then she has published more than thirty books all over the world—from France and Italy to Japan and the United States. Some of her books available in the United States include A Lion in Paris, which Kirkus Reviews called an “artful, whimsical delight,” and The Wonderful Fluffy Little Squishy, which won the 2016 Mildred L. Batchelder Award. Beatrice makes her home in Paris, where she lives with her husband and two daughters. “Heartbreakingly beautiful. You get the sense that she becomes totally lost in it while drawing and as a viewer you want to do the same. I think this might be Beatrice’s most breathtaking work yet.